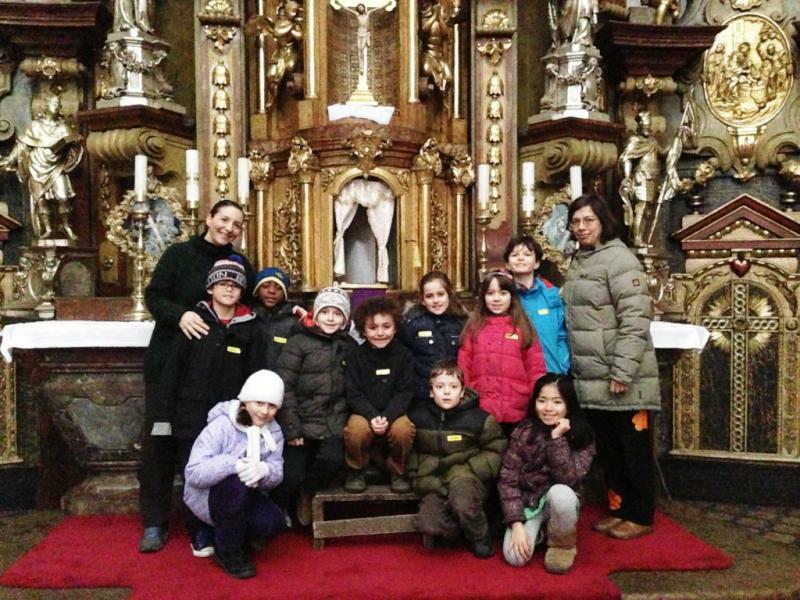 Religious Education class fees are due: 900CZK for regular classes, 1200CZK for sacrament preparation classes. Those who haven't yet paid can do so either directly in cash to Mary Beth Hlavsa or via bank transfer using the following details (bank code 0800, bank acct: 155523359). Please be sure to attach a note to the transaction with your child's name(s) and class, and that the payment is for their RE fee. If there are any financial difficulties, please see Mary Beth, or William Revellese (our Financial Officer – wjrevelle@hotmail.com) for options. Another payment option is to use the "red slips" available in the back of the church where the missals are distrubuted if you prefer to pay at the post office. The bank details are pre-printed on the forms. Please read through this important information about the St. Tomas Religious Education program. We look forward to seeing your child on Sundays at 9:45am! Mary Beth Hlavsa is the new Religious Education Coordinator for the 2012 – 2013 year, with former-coordinator Monika Shaheen providing valuable assistance. Please sign up your children now for RE this year! Contact details are at the bottom of the page. Please contact Mary Beth with your children’s name, age, and year in school, as well as a RE history if you are new to the St. Tomas community. In order to further the cohesion among classes, this year we will be trying out a theme or focus point for each week. Themes include topics such as angels, saints, Advent or Lent preparation, praying, etc. Teachers may either use this theme as full class material, or as an intro before heading on to the main lesson for the day, at their discretion. We will be handing out a list of each week's theme focus point, and greatly encourage you to discuss these topics with your children at home! This year we would like to provide more additional group activities for our RE classes. Ideas and suggestions for field trips are very welcome – please contact Mary Beth. A full RE calendar will be posted soon, including the holiday schedule and tentative dates for the celebrations of the sacraments of First Reconciliation and First Holy Communion. Please note that some dates may change, and some additional activities such as field trips are not yet scheduled – we will of course provide information as soon as we have it. Should dates change, you will be notified in advance both via e-mail and on the English-speaking community’s notice board located on the wall to the left of the inside entrance to the cloister garden. Up-to-date information will be also available on the website and in the weekly bulletin. If your child is preparing for First Holy Communion, please be aware that under normal circumstances, only 3 absences from class are acceptable throughout the school year. Also, participation in the First Reconciliation and First Communion Retreats is required in order for the child to be able to receive the sacrament. Our students attend a number of schools, both international and Czech in and around Prague, and unlike in past years, there is no longer a clear majority of students coming from just one school. This presents a challenge for us as we are bound by just one overall parish calendar but the school breaks may vary. While we make every effort to accommodate different calendars, the children will not receive the full benefit of the program if they miss class every time there is a break both on the Sunday prior to the break and on the Sunday when it ends. Therefore, we request you to please take our RE calendar into account when planning your trips outside Prague during school breaks, especially if your child is preparing for First Communion or Confirmation. Absences from class: if you know in advance that your child will not be at class, please make sure to contact your child’s teacher or myself as soon as you learn of the upcoming absence. I cannot stress enough how very important this is, as it is unfair for a teacher to find only 1 or 2 students in the classroom without previous notice. Unfortunately, this situation occurs every year. Teacher contact information and a student list for each class will be distributed as soon as completed via e-mail. One Sunday each month the 11:00 Mass is a Children’s Mass. At this Mass, the children participate in different ways during the Liturgy of the Word, Offertory, or with a special class presentation or song (Children’s Mass is marked on the calendar as CM). Each Children’s Mass is hosted by one (or sometimes two) class(es). Dates on which of the classes will host each Children’s Mass will be marked in the calendar on the notice board and on the website as soon as agreed among the teachers. Parents of the hosting students will be reminded in advance to make sure their child is in class and at Mass that particular Sunday. As some classes are small, strong attendance is very important as otherwise the Children’s Mass can be easily jeopardized if two or more students don’t come to Mass. 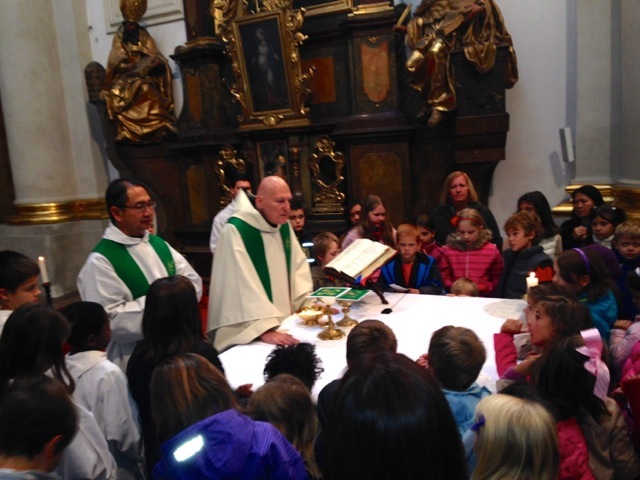 On non-Children's Mass Sundays, there will be Children’s Liturgy of the Word. The children’s liturgies are also marked on the calendar (L). Before the readings, Fr. William invites all children to the altar and they go to St. Dorothy’s chapel with an adult for their own liturgy of the word including gospel reading, a discussion, and crafts or music, related to the theme of the gospel, before returning to the main congregation for the offertory. This class not only makes the liturgy of the word more understandable and enjoyable for the children but it also allows you, their parents, to fully concentrate on and enjoy the readings and the homily. However, I would like to stress that children under the age of 4 must be accompanied by an adult as otherwise, being unable to quite follow and participate in the class, they often disrupt the other children and the leader. As we have seen a decline in the numbers of older children (above the first communion level), we would like to encourage their participation this year. While their contribution to the lesson is very important and enriching for the younger children, we also believe that the benefit of the class for them is still greater than listening to homilies directed to adults. Please consider leading a children’s liturgy of the word 1-2 Sundays this year! Leading the children’s liturgy requires neither previous experience nor much time for preparation. All materials are provided and as parents of the children you are best suited for this type of service. Your experiences allow you to know best how to present and explain the different topics to children using examples from your every-day life. Having a number of volunteers ensures that no one has to lead more than once or twice during the whole year. Volunteers, please contact William Revellese (you’ll find his contact information below). Classes start at 9:45 a.m. Please arrive on time! Late arrivals do cause disruptions to the class and a loss of valuable time, not to mention the material that your child will miss. We encourage participation by the students at Mass on a regular basis. Parents are urged to see participation at Mass as an integral part of their children’s religious education and as important as the class itself. We all need to do our best to ensure that the children not only learn the classroom material during the very limited class time but also experience our faith through Mass, the community, and through family life. We urge you to please plan your Sunday mornings in a way that allows your child’s participation from 9:40 to approx. 12 o’clock, including participation at Children’s Liturgy of the Word (see above) or at Children’s Mass (above). Let’s make a child’s departure immediately after class an absolute exception. The absolute minimum age for admission to the Kindergarten class is 4 years (age calculated as of the 1st of September for the given school year), younger children cannot be admitted. Our Confirmation program continues to take the form of a 2-year program to help ensure that the Confirmation is not merely a formal event and that candidates are prepared and can appreciate the meaning of the sacrament, including a commitment to further actively participate in the Catholic community’s life. The Post Communion III group is not the same as Pre-Confirmation. Only students who actively participate in the class both years will be considered for Confirmation. However, we encourage active participation and attendance at all levels, since each year builds on the last, culminating in sacrament of Confirmation. A copy (not an original please) of the baptismal certificate is needed for all children preparing their First Communion. Please hand it either to your child’s teacher or to Mary Beth at your earliest convenience. Please attach also the postal address of the parish of baptism if it is not clear from, or complete on, the certificate. At least one completed year of religious instruction at pre-communion level is required for children enrolling in the First Communion Class. This is necessary for their understanding of the sacraments of First Reconciliation and First Holy Communion and avoids major differences in the level of their knowledge, understanding and engagement in class. If your child is coming from another parish, please provide a confirmation by the former parish of previous religious instruction (an e-mail is sufficient). We appeal to parents of those children who recently received their First Holy Communion to continue to enroll their children in our religious education program up through their Confirmation since each year offers unique experiences and allows them to build their knowledge-base and faith habits as well as encouraging them to continue to be challenged by faith which is essential for lifelong learning and faith-forming habits. Program fees this year are 900 CZK per child for all regular classes. For the First Communion class, the fee is 1200 CZK and covers the costs of special retreats in preparation for the sacraments and the costs associated with the sacrament celebration. The fees for all students cover a part of the cost of student books (which each child keeps at the end of the year), the cost of teacher manuals, other tuition-related books and materials including printing costs, e.g. materials for the Children’s Liturgy of the Word and activities related to specific feasts and periods (such as the making of Advent wreaths, etc.). Financial assistance is available to anyone in need. A 50% discount from the total fees is offered to parents who volunteer to teach or who regularly assist the teachers or the coordinator, or lead the Children’s Liturgy of the Word on a regular basis. Please see Mary Beth about payment or leave the exact amount with your child’s teacher in an envelope bearing your child’s name by the end of October at the latest. Families that are new to our parish are requested to complete the Parish Registration form. You can pass it on directly to Mary Beth or to Father William, or leave it in the sacristy for him. Please check information about classroom locations on the notice board in the cloister garden. The classroom names are on the doors and we'll be on-hand to assist. If you have any questions or suggestions for the program, please do not hesitate to contact us or Fathers William or Juan. We are looking forward to working with you in supporting and furthering your child’s faith development and creating a sound base for lifelong faith and practice! All Saints Day - They came marching in! !